Glisten® Dishwasher Magic® powerfully removes limescale, rust, grease and other buildup caused by hard water, detergent and food residues. Over time, this buildup affects your dishwasher’s cleaning performance and can lead to the presence of harmful bacteria.† Regular Glisten dishwasher cleaner use keeps your machine amazingly clean, fresh and maintained. Unlike other machine cleaners, Glisten cleans and disinfects even the hidden, vital and hard-to-reach areas. 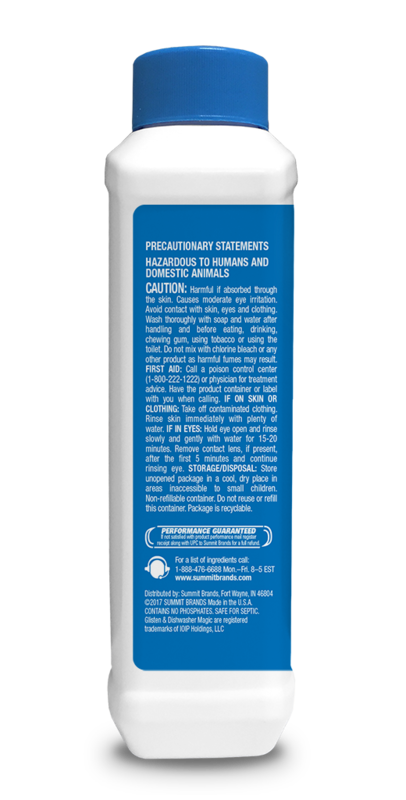 It is specially formulated to penetrate buildup and hard water impurities so they can easily be removed from your dishwasher’s water jets, tubes and pipes, while also disinfecting against harmful bacteria.† Glisten, the only EPA-registered dishwasher cleaner and disinfectant, is safe for all dishwashers, plumbing and septic systems. Available in 12 fl oz and 24 fl oz sizes. Glisten Dishwasher Magic provides a powerful, yet safe clean. As a powerful dishwasher hard water cleaner, Glisten removes mineral and other buildup from the entire machine, which over time affects your dishwasher’s cleaning performance. 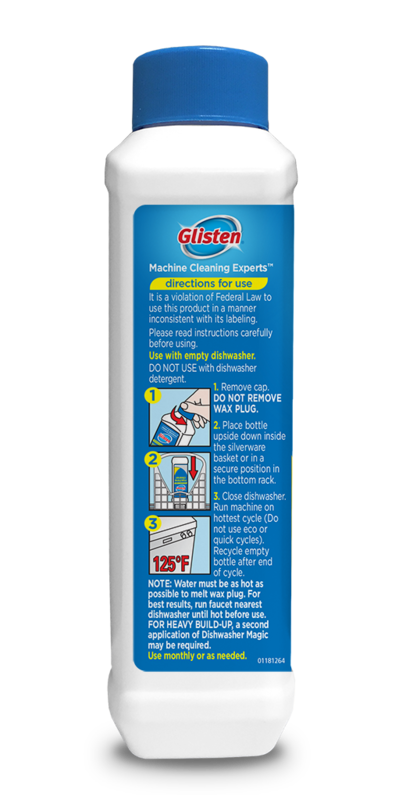 Glisten is also uniquely formulated to disinfect your machine against harmful bacteria.† Glisten works in all dishwashers and is plumbing and septic safe. Non-Compatible Surfaces/Materials: Dishwasher Magic can be used on all types of dishwashers, including stainless steel interiors. EPA/Design for the Environment (DfE) recognition does not constitute endorsement of this product. The DfE certification signifies that the formula for this product, as Summit Brands has represented it to the EPA, contains ingredients with more positive human health and environmental characteristics than conventional products of the same type. 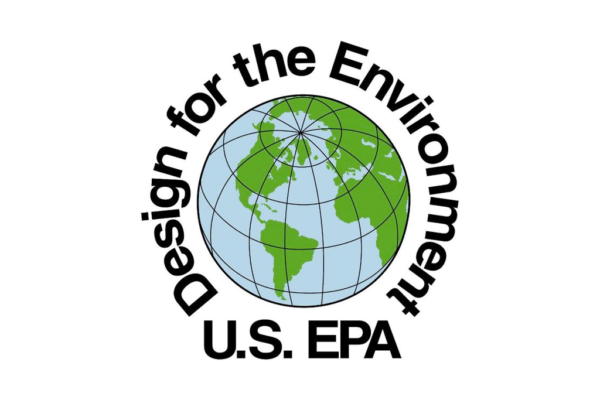 EPA/DfE relies solely on Summit Brands, its integrity and good faith, for information on the composition, ingredients, and attributes of this product. EPA/DfE has not independently identified, that is, via chemical analysis, the ingredients in the product formula, nor evaluated any of Summit Brands’ non-ingredient claims. EPA/DfE provides its evaluation only as to the product’s human health and environmental characteristics, as specified in the DfE Standard and based on currently available information and scientific understanding. To learn more about the Design for the Environment Antimicrobial Program, visit their website. Dishwasher Magic is a limited disinfectant against gram-negative bacteria Eschericha coli (ATCC-11229) and Salmonella choleraesus (ATCC-10708). †Effective Disinfectant: Dishwasher Magic is a limited disinfectant against gram-negative bacteria Escherichia coli (ATCC 11229) and Salmonella choleraesuis (ATCC 10708). My dishwasher looked old and hideous. Tried this stuff now it looks brand new! Great product and necessary to use regularly to keep dishwasher from building up gunk over time. Also, AMAZING customer service. Hard to find that these days. Thank you! Used this in our 10 year old dishwasher for the first time. WOW ! what a difference it made. Inside looks new again. Will use it more often now. Read entire label before using. Use with empty dishwasher. Do not use with dishwasher detergent. Remove cap. DO NOT REMOVE WAX PLUG. Place bottle upside down inside the silverware basket or in a secure position in the bottom rack. Close dishwasher. Run machine on hottest cycle (do not use eco or quick cycles). Recycle empty bottle after end of cycle. Note: Water must be as hot as possible to melt wax plug. For best results, run faucet nearest dishwasher until hot before use. For heavy buildup, a second application of Dishwasher Magic may be required. Use monthly or as needed. Do not mix with chlorine bleach or any other product as harmful fumes may result. Never return spills in original containers for re-use. Do not use with dishware inside the machine. 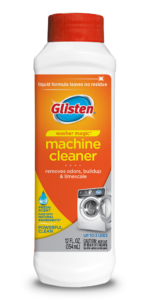 + What exactly does Glisten® Dishwasher Magic® do in a dishwasher? 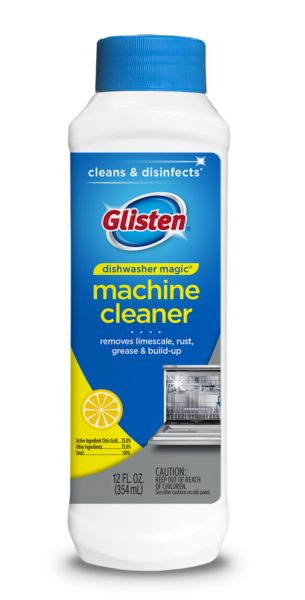 Glisten® Dishwasher Magic® powerfully cleans and removes limescale, rust, grease and other buildup from the dishwasher filter, pump and jets including the hidden, vital and hard-to-clean parts. This buildup starves the pump of the water supply needed to effectively clean the dishes. 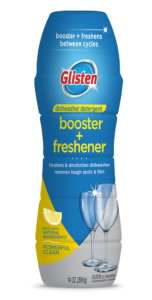 Glisten cleans and disinfects dishwashers, restores their cleaning performance and enhances their lifespans. + What does Dishwasher Magic disinfect against? 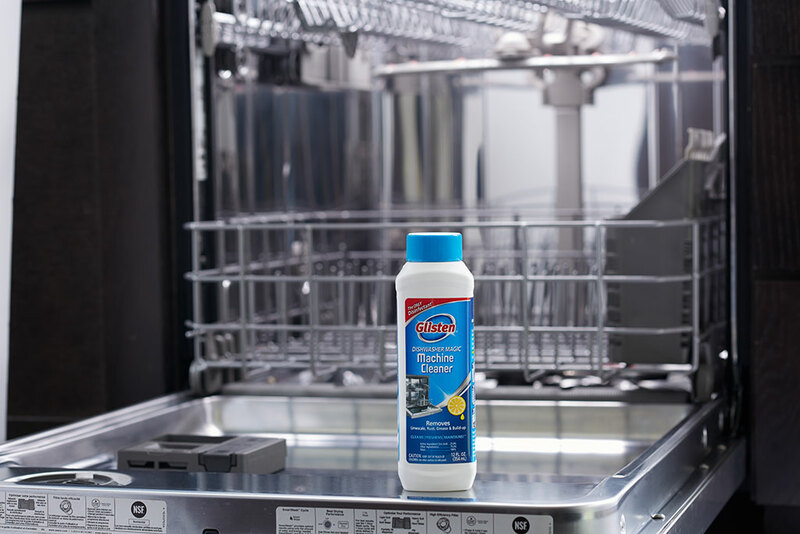 Glisten Dishwasher Magic is the only EPA-registered dishwasher cleaner and disinfectant. It is an effective limited disinfectant against gram-negative bacteria Escherichia coli and Salmonella. + Does Dishwasher Magic dissolve limescale? Limescale is insoluble in water and is resistant to the normal alkaline detergents used in dishwashing machines. Dishwasher Magic dissolves and removes limescale, as it is specially formulated to increase the solubility of limescale. As an effective dishwasher hard water cleaner, Dishwasher Magic also removes rust, food oils, grease and other buildup like soap scum left over from normal operation. Dissolved buildup is then flushed away by the normal rinsing actions of the dishwasher. + Where can I buy Dishwasher Magic? + How often should I use Dishwasher Magic? Dishwasher Magic is recommended once per month to keep the dishwasher clean, buildup free, fresh, working efficiently and lasting longer. + Why do I need to use Dishwasher Magic every month? When you run your dishwasher, the heating element inside keeps the water at an average temperature of 125° Fahrenheit depending on make and model. The food oils and particles that are being removed from the dishes combine with the hot water and detergent. Soap, grease and limescale begin clinging to the filter screen, starving the pump and spray arms of the velocity and quantity of water necessary to adequately clean your dishes. 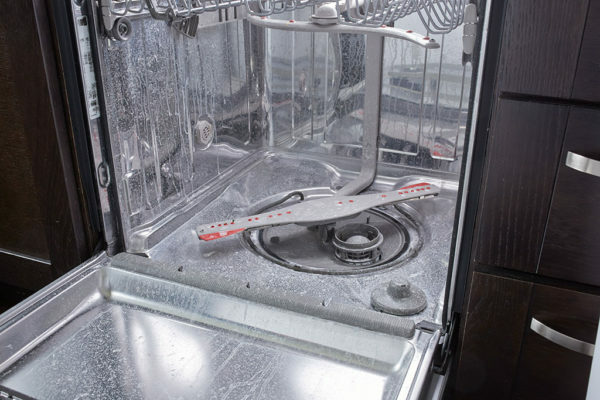 As buildup increases, the cleaning performance of the dishwasher is impaired because water is no longer effectively circulated to the cleaning jets. Dishwasher Magic removes buildup from the interior, filter, detergent drawer and other hidden, vital and hard-to-reach areas. To ensure a clean, buildup free, fresh and optimally performing machine, we recommend monthly use of Dishwasher Magic. + Is Dishwasher Magic easy to use? This innovative product is very easy to use. Simply remove the cap, place the bottle upside-down in the bottom rack silverware basket, then run washer on normal cycle. Remove bottle once cycle is complete. + If Dishwasher Magic does not fit in my silverware basket where else can I put the bottle? 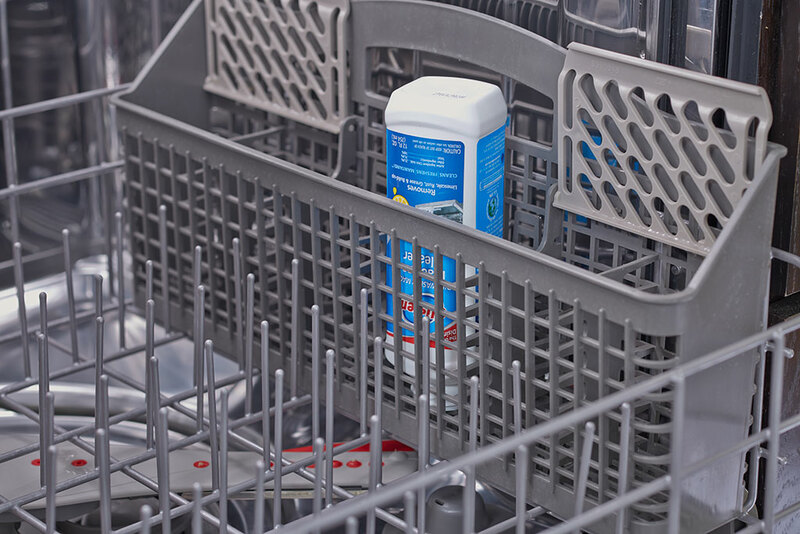 Dishwasher Magic is designed to fit in all standard size silverware baskets. However, if your basket does not accommodate the bottle, you can still use this product. The bottle must be placed upside-down in your lower dish rack, but not directly over the heating element. Use a rubber band wound around the bottle and the prongs on your dish rack to secure it in place during the cycle. Follow usage directions and remove the bottle and rubber band once wash cycle is complete. + Can I leave dishes in the dishwasher while I run Dishwasher Magic? Glisten Dishwasher Magic is formulated as a dishwasher disinfectant and intended for cleaning the dishwasher only. We do not recommend leaving dishes in the dishwasher while running Glisten Dishwasher Magic. If dishes have been mistakenly left in the dishwasher while using Glisten Dishwasher Magic, we recommend hand washing those dishes with warm soapy water to ensure the cleaning chemical has been completely rinsed away. + Is Dishwasher Magic safe for my septic system? When used as directed, Dishwasher Magic is septic safe and will not harm the bacteria within the system, the plumbing or the appliance in any way. + Can I use this product with a stainless steel dishwasher interior? Dishwasher Magic, when used as directed, is safe for use in all dishwashers, including stainless steel interiors. + When I ran my dishwasher, the solution never came out of the bottle. Did I do something wrong? Was the bottle placed and secured upside down in the bottom rack? Was the product run on a longer, hotter cycle (normal, pots and pans, sanitize) and was the door closed the entire cycle? Was the hot water run in the sink closest to the dishwasher before starting the dishwasher? Is the hot water heater set to reach temperatures necessary to melt the wax plug (125°F)? It may be necessary to have the heating element in your dishwasher evaluated, as it may be a timer problem, a bad sensor or a bad heating element. + Is Dishwasher Magic kosher? While Dishwasher Magic does not have kosher supervision, there is nothing in the product that will render it not kosher. + Doesn't the dishwasher clean itself? Every time you run your dishwasher, hard water, detergents and food oils build up on the heating element, pump, hoses, filter and interior surfaces of the appliance. This buildup and residue affect cleaning performance and can develop odors within the machine. Manufacturers universally recommend that owners regularly clean the appliance. 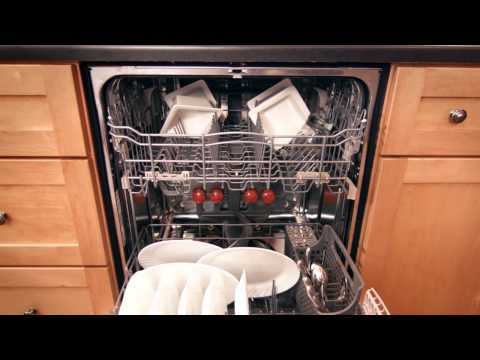 Dishwasher Magic not only powerfully, but safely cleans and disinfects. A clean machine smells fresher, runs more efficiently and lasts longer. + Which dishwashing cycle do I run when using Dishwasher Magic? Internal temperatures must reach 125° for the wax plug to melt, releasing the cleaning chemical during the wash cycle. To ensure this temperature is reached, Dishwasher Magic should be run using the hottest and longest running cycle of your machine, such as the “Pots and Pans” or “Sanitize” cycle. The wax plug will not melt using shorter cycles such as an “Eco” or “Quick” cycle. + After using Glisten Dishwasher Magic, do I need to run a rinse load before running my next dishwashing cycle? 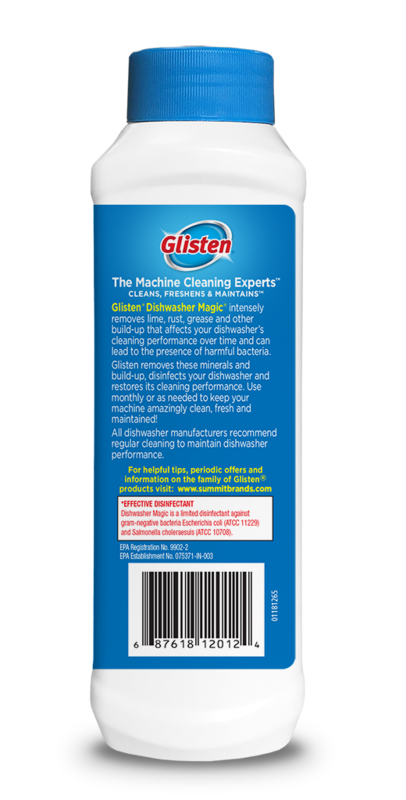 When used as directed, Glisten Dishwasher Magic is designed to release the cleaning chemical during the wash cycle and is fully rinsed from the dishwasher interior during the post-wash rinse. Once the dishwashing cycle is complete and the Dishwasher Magic bottle is removed, the machine is ready for everyday usage. + When using Dishwasher Magic, I mistakenly left dishes in the dishwasher. What should I do? Glisten Dishwasher Magic is designed to be used in an empty dishwasher, as it is a cleaner and disinfectant. If dishes were left in the dishwasher when using Glisten, we would advise handwashing the dishes with hot, soapy water to ensure the cleaning chemical has been completely removed. + Can I use Dishwasher Magic when the rinse aid compartment is full? Dishwasher Magic should not be used with detergent or other chemicals. For best results, Glisten should be used when the rinse aid is empty.